My name is Eric Beckwitt. I’m the Founder and CEO of Freightera. I would like to thank Dr. Nicole Serrij for bringing me here and also for the people at CCTNE who made certain that I wrote the thought leadership article for the G7 Summit. 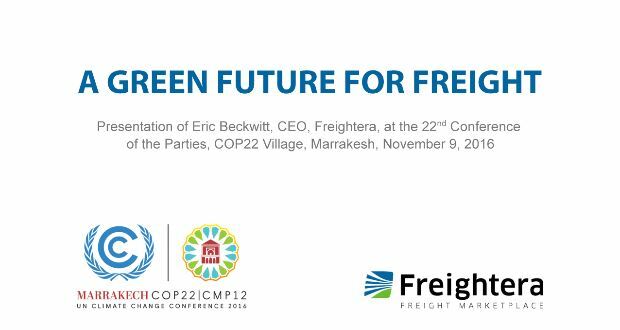 As many of you may be aware, freight shipping, international shipping and also aviation are not included in the COP21 agreement. Currently international freight transport is about 10% of the total greenhouse gas emissions but it’s going to grow based on the recent projections of the European parliament to between 20 and 50% of the total global greenhouse gas emissions by 2050 under business as usual scenario. What I would like to present today is there’s an industry perspective on how we can actually – using market mechanisms, immediately reduce gas emissions on the range of 20 to 30% easily and then a longer-term perspective get out to low and zero emission freight. The first thing to keep in mind is that transport is the second largest emitter of carbon dioxide following energy production in the world. It’s currently 19% of total CO2 emissions. The problem we know less is the contribution to total nitrous oxides. The shipping industry is currently a vast producer of nitrous oxides and sulfate oxides, produce about 15% of the total nitrous oxides emissions in the world. Transport uses 64% of the oil globally. So actually, when you look at the production and consumption of oil, this is really all about transportation, and the key that we have to do in terms of going to sustainable transportation is to move completely away from oil. As I mentioned before, freight transport is currently seven percent of freight emissions. In digging through these, each of these different scientific studies and the research papers that I found have different numbers, so bear with me. That’s science and that’s real and the actual numbers are always somewhere in between. This is data from the carbon footprint study from the OECD. They look at freight transport being 7% of the greenhouse gas emissions and they show it growing to 290% by 2050. Notice that almost all of that growth is actually in sea and road transport. We have no projected growth in rail transport. I will get into that in a moment. Air transport, even though it increases by 400% during that time frame, it’s starting from such a small number that it really isn’t a very significant thing that’s serious. But note what’s happening with road transport, which is the number one thing that we need to deal with. Few people actually understand the impact of what’s happening in the oceans with growing sea transport. There was a study published in Nature in February of this year 2016 that annual sea transport is currently producing 15% of the nitrous oxides, global nitrous oxides emissions and 13% of the sulfur oxide emissions and growing rapidly. It’s also producing a vast amount of particulate matter and 20% of the major ports in the world produce 20% of the total nitrous oxides. There are also several studies that show that 60,000 people a year are being killed by the shipping industry by cancer deaths primarily from particulates and the recent moves to actually clean this up are limited to these emission control zones. You will see those are – I don’t know how to describe these. They’re completely unfair emission control zones. We’re looking at emission control zones that basically only cover a narrow zone off the East and West Coast of North America, Europe, the Mediterranean and Japan and in those zones, ships are required not to use low sulfur fuels and to use scrubbers and outside the zone, it’s business as usual. Let’s also note that in this column on the lower left, that’s from the European parliament and it shows the blue column which is the total nitrous oxide emissions from land falling, primarily from automobiles, and unregulated growth the shipping. The maritime sector shows that the nitrous oxides from shipping will eclipse that land by 2020 and then still rapidly grow until it’s 40% more than the total land production of nitrous oxides. In terms of carbon dioxide emissions from freight, the carbon footprint study from OECD shows freight transport emissions are expected to grow 320% in Asia and 315% in Indian Ocean and 273% in the North Pacific by 2050. The North Pacific will shortly overtake the Atlantic in terms of shipping traffic, becoming the primary shipping region in the world, and we’re looking at very, very rapid growth in emissions also in East Asia. This is based on work from the European parliament in 2015. I had to stare at this twice to make certain this could possibly be right. Notice what’s happening here – around 2015 where the emissions begin to take off. Based on their models–they’re looking at air and marine transport, which you will remember is unregulated – being 20 to 50% of the global greenhouse gas emissions by 2050. Just taking off exponentially and becoming this complete disaster. In transitioning to green freight, the key thing that we need to do – just like we need to look lower on the food chain – we need to move down on the carbon dioxide and nitrous oxide emissions chain and through this, avoid, shift, improve strategy. Notice the worst possible thing you can do with freight is put it on an airplane. The second worst thing you can do is put it on a truck. The third is on a train and the best thing you can do is put it on a ship or put it on inland waterway in terms of grams of carbon released per ton per kilometer. The very first thing – and this is obvious – is that we have to avoid shipping freight long distances whenever we can. We currently have this environment, as economists have pointed out, where our butter cookies meet in the middle of the Atlantic. The butter cookies produced in North America pass the butter cookies produced in Europe, on the way back and forth, which is frankly ridiculous. We have that for lots of resources. We’re shipping wheat back and forth, potatoes, all of these primary resources. So you really need to be sourcing whenever possible, as industries, we need to be sourcing stuff locally. It’s not something we can completely control, but it’s something which we think about we can begin to do. Once we recognize that we must ship these long distances, we need to be shifting the freight by mode. That’s where we have major opportunity immediately for improvements. This stuff that needs to be shipped by plane, you plan better two months in advance and you ship it by sea. The stuff that needs to be shipped by road, you take a few extra days and you ship it by rail. When you do those things, you have dramatic reductions immediately in carbon dioxide emissions. You can see on the chart how big that is. Going down to like 90% reduction depending upon which mode you actually use. We also need to concentrate strategically on the largest greenhouse gas freight emission sources first. There’s no point in just implementing this globally. The number one source that we have to work on is in North America, particularly the United States. The number two place we have to work on is in China and then we also need to work in India, which has a large emissions rapidly growing. In Eastern Europe and in other parts, but really important to do this strategically and roll this out, actually hit the most important places first. It is remarkable what the maritime industry learned in the downturn in 2008. It’s remarkable what downturns force you to do. This was brought to the attention of one of our investors in our company who is the master and commander of one of these large freight vessels. Due to the use of fuel, if you reduce your speed by between 10 and 20% on one of these freighters, you will cut the carbon dioxide emissions within 15 and 39%. There are a series of other operational measures that can decrease your carbon dioxide emissions by up to 60%, without changing out anything, just by the way you’re handling the ship in terms of performance. I should say there’s a combination of simple adaptations like wind, sails and lubrication and modified propellers. But if you just use the speed reduction, just using speed reduction, you can get carbon dioxide reduction emissions of up to 39% and it only adds a few days to the typical trans-ocean passage and those costs can be passed on to the consumer and becomes less expensive. You have a positive feedback loop where everyone wants to ship that way. It becomes the least expensive option. The other thing on land is shifting all possible long haul freight that is greater than 300 kilometers from road to rail or inland waterways. We get immediate emissions reductions of 60% and I will show you what that looks like now. This is based on the European Union study. Then lastly, we need to be fair and we need to implement the scrubber technology which has been developed for the emission control zones. It needs to be implemented worldwide immediately. We need to have scrubbers – we actually have the technology right now. This does involve retrofitting engines. This is one of the few things that actually involves investment and we need to have financing for. But that would allow us to reduce the nitrous oxides and sulfur oxides by 90% plus immediately worldwide by retrofitting these ships and particulates in the black carbon by up to 60 or more percent. So that’s something that industry can do, that’s something where I get involved. Lastly, if you use online marketplaces like ours to find the lowest emission option, frequently the lowest emission option is also the least expensive. We’re working right now on a partnership with the government of Canada and the US EPA through the SmartWay Program to label the SmartWay carriers and just to put this up – I did this search. This is from Eastern Canada down into Texas and these are several carriers. Notice the distribution of the SmartWay carriers in terms of the pricing mix. The price moves from $900 up to $4000. All of the least expensive carriers are members of the SmartWay emissions reductions program. Now let’s talk about long term. So those are the immediate quick wins. Long term, this is all about renewables and this is a graphic from CleanTechnica, it really nicely sums this up. Those units are Terrawatt hours and we see the renewables on the right for you, we see the finite non-renewables, including all that’s available potentially from nuclear power, from uranium, from coal, all of the other sources. Notice that these units are the same. But their renewables replenish every year and the others are fixed. We don’t have – we fundamentally don’t have – an energy crisis at all. We have a shift in terms of what we need to use and in terms of efficiency and in terms of intelligence. You may have seen some of these studies. This was also from CleanTechnica. Already, based on the most recent bid prices for wind and solar – wind and solar now without subsidies – wind and solar is completely outcompeting all of the other conventional sources. So effectively, once you remove subsidies and you let people actually bid, no one can compete anymore with wind and solar installations as we speak and the price continues to crash. From a strictly economic perspective, in terms of investment, there’s not going to be any further investment in coal. There will be further investment with oil and gas as long as you allow those technologies to freely compete in the open market. The gold standard for transport of freight overland in the continental interior is sustainable electric rail – zero emission rail. This actually was almost by accident installed in Eastern Russia before the revolution. The entire Eastern Siberia part of the Trans-Siberian railroad, it’s all hydroelectric, zero emission. It works beautifully. One of the things – the key things to do in Canada and United States, in Europe is actually convert the existing trains to sustainable electric and run all the freight we can this way. The other thing that we need to do is look at connecting the continents for sustainable electric rail. There are several parties looking into this right now. This has been voted two times by the Russians, looking at extending the Trans-Siberia through the Bering Strait and there’s also extensive work taking place right now. The government of China is interested in this. Canada and the United States are also interested in this, but less than the Chinese and the Russians and we’re also looking at extending the railroad system between China and Europe through the old Silk Road. So we can actually have zero emission vehicles connecting those major industrial regions and markets. In terms of actual marine transport, there are multiple companies that are working on hybrid electric and purely solar electric vehicles that are both cargo vessels, tankers and car carriers. Some of these have already been around the world and demonstrate this works beautifully. Some of them are completely solar-powered, which is really excellent. So it’s not about technology. It’s just about actually making the transition. The same thing in trucking. We already have – in Europe, we have – last mile delivery with zero emission vehicles. We have zero emissions vehicles working in drayage already in the port of Los Angeles. We have several companies working on these electric vehicles for both long haul and short haul. We’re going to have the short haul first and then long haul. It’s all coming. This was really surprising to me. I actually didn’t realize this was happening until I did this research. How many of you have seen these solar-powered air ships? Have you seen this technology? This is working right now. The Chinese already have this working. An air ship has much higher capacity, lifting capacity, than an airplane. They can – because they have a vast surface area — they can be retrofitted to solar. They can be actually designed for solar. They move 200 miles an hour and this could come and actually completely disrupt the airline industry at the speed it’s taking off. Lockheed Martin has developed this already. The Chinese have developed this. There’s a company in England who has already developed this. I want to talk briefly about how Freightera is working on this right now. Freightera is an online marketplace. We’re in North America right now. We’ve won a bunch of awards for innovation and the key thing that we’re doing is we’re bringing together all the shippers and industrial carriers into a single location where you get the best quote, the lowest cost. What we’re finding is that frequently those carriers with the lowest costs – because companies are really well managed have the lowest costs – are also the lowest emission option. So in the near future, what we have our vision to get the lowest emission, best rate, and book freight between any two locations on earth in 60 seconds. We expect to be there within two to three years. We’re building the LinkToRail system which has greatly expanded the capacity of the railroads starting in the United States and Canada. I want to give you an example of this. This is working right now. I pulled this up right before this presentation. The port of Long Beach is one of the busiest ports in the world. This is a recent booking. We’ve done 4,000 of these already. Notice that it costs 44% less to book by rail and it was 80% less carbon dioxide emissions in this example. Moving freight from Long Beach, California to Dunwoody Georgia through our system.